Mascarpone and blackberry chocolate tart. Although often spoken of as a soft cream cheese, mascarpone is technically not a cheese at all but a dairy product made from cream coagulated with acetic or citric acid (for the home cook, lemon juice). A centuries-old tradition from Lombardy in Italy’s north, mascarpone was once just a seasonal product, appearing only in winter when nature provided the refrigeration needed to keep this very fresh product at its best. Today, it’s available year round and is still most commonly used as the main ingredient in that favourite Italian dessert, tiramisu. But mascarpone has plenty of other wonderful uses, including savoury dishes. Here is how to make it and two of my favourite ways to enjoy it. 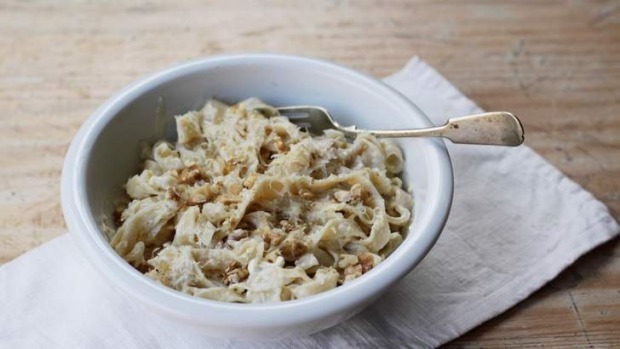 Tagliatelle with mascarpone and walnuts. Despite the two-part recipe, this is really the simplest of preparations. 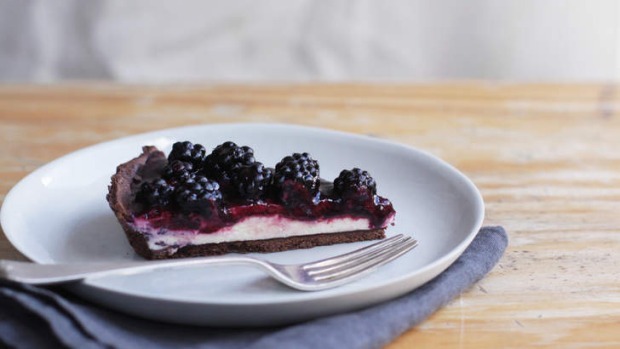 The combination of chocolate pastry and fresh blackberries with a smooth, subtle vanilla mascarpone filling is a winner. You can blind bake the tart ahead of time and fill it just before serving. If chilled, this tart is best when taken out of the fridge about 30 minutes before serving. Rub the butter into the flour until the mixture resembles breadcrumbs. Add the sugar, cocoa powder and egg and combine until the mixture forms a dough. If it’s a little dry, add some cold water, a tablespoon at a time, until it comes together. If it’s a little wet, add some flour, a tablespoon at a time, until it comes together. Let the dough rest in the fridge at least 30 minutes before using. Roll out the dough on a dry surface dusted with cocoa powder, then place in a pie tin. Chill in the fridge before blind baking at 180C for about 15-20 minutes or until the surface is dry to the touch. Let cool completely before using. Whip the mascarpone together with the icing sugar, yoghurt and vanilla until smooth and creamy. Set aside in the fridge. Place one punnet of blackberries in a saucepan with the raw sugar. Cook the berries until they soften, the sugar dissolves and the liquid produced by the berries cooking reduces slightly. Strain the berries through a fine sieve, collecting the smooth, jammy blackberry liquid in a bowl. Let cool completely. Fill the chocolate pastry case with the mascarpone filling and top with the fresh blackberries. Pour over the smooth blackberry liquid to cover the entire tart. This recipe is inspired by one described by Elizabeth David in Italian Food (1954). It makes a super quick week-day meal that at the same time seems incredibly indulgent and special. The only thing that you need to cook in this recipe is the pasta, which only takes a few minutes when using fresh pasta (store bought or homemade). The mascarpone and Parmesan melt into a beautiful, creamy sauce when tossed with the warmth of the freshly cooked pasta. If you like a hint of spice, some freshly grated nutmeg is wonderful on this. Boil the tagliatelle in a large pot of boiling water until al dente. Combine the mascarpone, butter, walnuts, salt and pepper and half the Parmesan in a bowl. When the pasta is cooked, drain, reserving some of the cooking water, and immediately toss the pasta with the mascarpone until coated. If it’s a little dry or sticky, add some of the reserved pasta water and stir through. Serve immediately, sprinkled with the rest of the Parmesan cheese. Good quality mascarpone is hard to come by outside of Italy. When you’ve tasted freshly made mascarpone, it’ll be hard to go back to anything you can find in the supermarket. Making it yourself at home means it’s as fresh as can be and has the bonus of costing a fraction of the price of mascarpone bought in a store. This is so unbelievably simple, you’ll ask yourself why you never tried this before. It goes without saying that the better quality cream you use, the better quality mascarpone you will have. 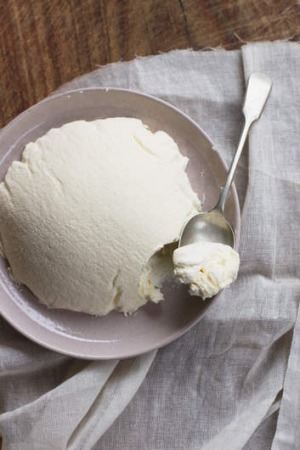 Country Valley make a ‘‘Classic Cream’’, which is a really great example, perfect for this home-made mascarpone. If you want to be precise, a candy thermometer and some muslin or cheesecloth is all you need, but don’t let that put you off trying this; some good timing, careful watching and a clean tea towel will also do the trick – the rest is easy. Using the bain marie (double broiler) method means that you won’t be in danger of boiling or burning the cream. The bottom saucepan should hold a few centimetres of barely simmering water, a heatproof bowl set sturdily over the top should not touch the water. Place the cream in the bowl and gently heat until it reaches 90C (this will take about 15 minutes). Take off the heat and stir through the lemon juice with a wooden spoon. You’ll notice the cream begins to get slightly thicker, coating the back of the spoon, but other than that you won’t see much else happen. Don’t be disheartened, the magic happens overnight. Pour the cream into a sieve lined with several layers of damp cheesecloth or muslin (or a tea towel, folded in half) over a bowl and chill, as is, but covered (resist squeezing it in the cloth or touching it). Leave in the fridge overnight or for at least eight hours before using. Keeps well for about a week, covered and stored in the fridge.